Starting in the fall of 1976, mostly on weekends and evenings, a friend and I, Powell Hughes, were designing and building an AAGT car from scratch. As it turns out, it did not race until the spring of 1978. After 10 years of building, tuning and driving race cars, I had learned that power to weight ratio, frontal area and tire sizes were the key factors to a fast car, not necessarily high tech and cubic dollars, although the latter certainly helps. Look what Porsche has done to the 911. It started out as an underpowered 912, with the motor hanging off the back of the rear axle. Not the best platform for a race car, but they made it work. My car had to be a better design, simpler to maintain and very durable to be a long distance racer. 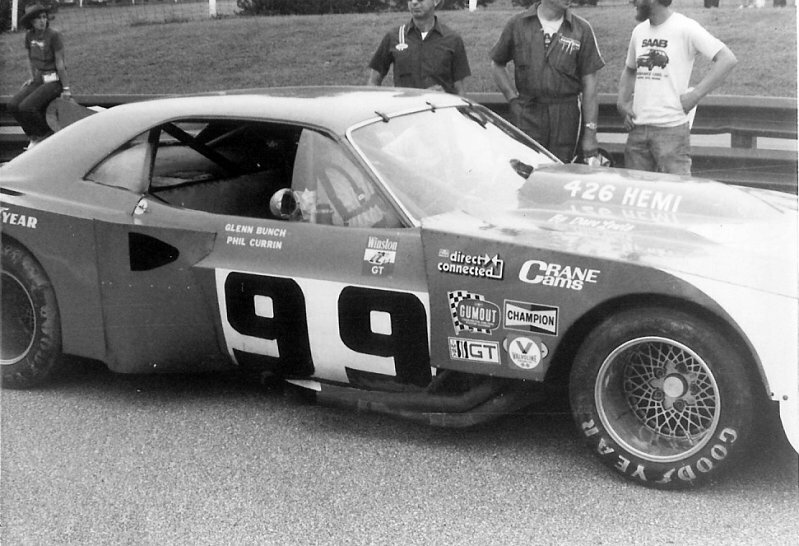 I thought about building a lightweight Corvette with a solid rear axle, but upstaging Greenwood would have been hard to do, and keeping up with Phil Currin hour after hour would have been a trick too. I needed an advantage. Therefore, I decided to do them all in. The only American engine to ever impress me was the mighty 426 Hemi. Even in the sixties I wanted one in a 2500 pound, balanced car, and to this day, I still get excited about them. I knew that the 426 Hemi was stronger and heavier than the Chevrolet engines, but it had a better chance of running with the 935 Turbo Porsches in a light car. In 1974, when the AAGT class was introduced, the car to beat was a non turbo Porsche 911, in various forms, but by 1977, you needed big power to run with a 935 Turbo. I was also hoping IMSA would allow turbo charging on big blocks. Then I would have the best engine in the series. 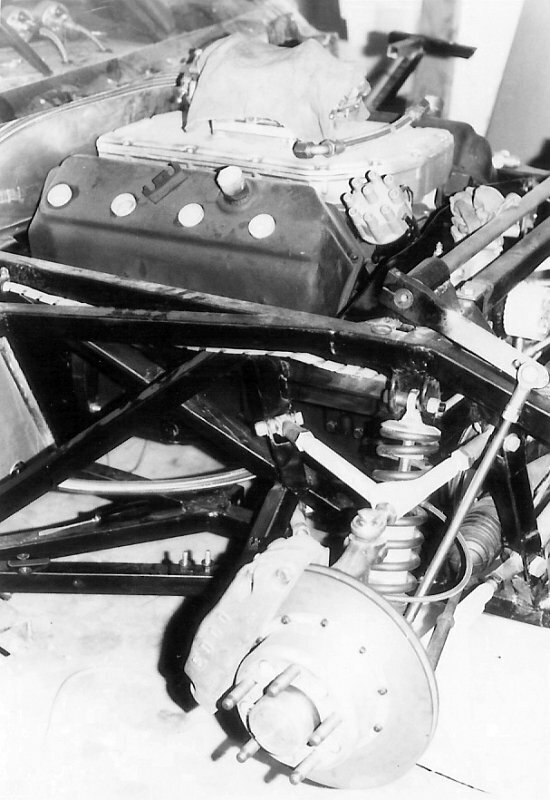 We called Petty Engineering and asked Maurice Petty if the extra weight of the Hemi over a 440 was worth the penalty. He excitedly said ” take the Hemi , take the Hemi and put 100 pounds in the rear bumper to make up for it”. He was amazed that there was still some place where a Hemi could be raced. In order to use a Hemi, I had to use a large bodied car like the Challenger, to get the needed motor set back, and would have to make all of the body panels myself. If it ran well, it would be a crowd favorite and therefore more likely to get a sponsor, so a Dodge it would be. 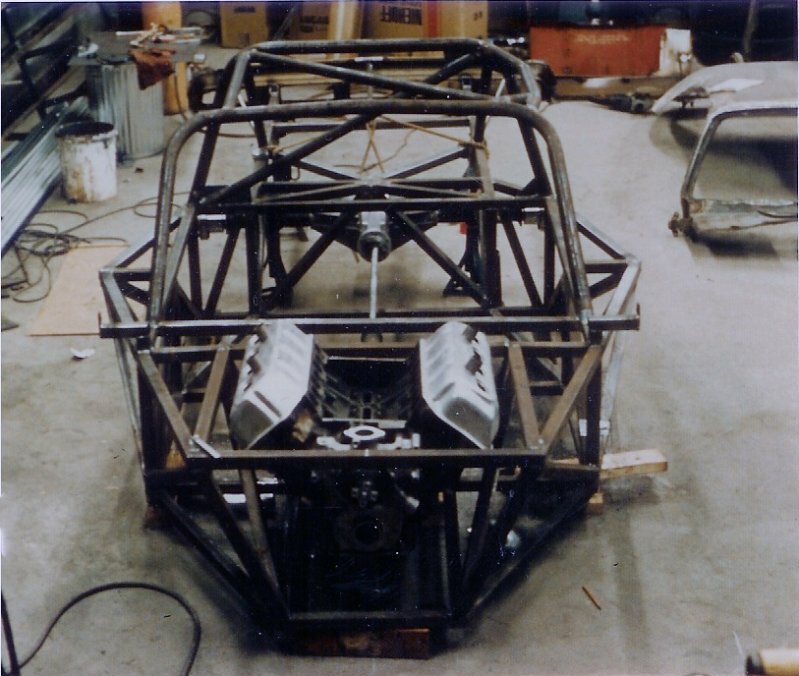 PHOTOS 21 and 22 show the first completed chassis and suspension that was entirely custom built. It took a lot of time to design and make the A arms etc. and decide on the geometry for the entire chassis. In PHOTO 21 you can see the Dodge Challenger roof skin to the right of the frame. The first frame was nearly finished when it was scrapped, because we had learned so much while making it and now we had input from Mr Larry Rathgeb at Chrysler on the design, so chassis number 2 was built, the one in picture 21. Mr Rathgeb changed our whole design concept with all of his knowledge about speedway tracks. He recalled details of certain cars setups and could tell you how much weight was on each tire in every lane on every turn, at different speeds at Daytona! He left no stone unturned if it could lead to more speed. The Dodge and Plymouth Superbirds of Richard Petty and Bobby Isaac and other Mopar racers had access to this first rate engineering, which contributed heavily to their success. We went to rear leaf springs, instead of a three link, and larger front tires, among other things at his suggestion. That car cornered well, hooked up great, and was nicely balanced, but as it turned out, it was just too heavy, which was my fault for not keeping track of the weights of all of the pieces before it was built. 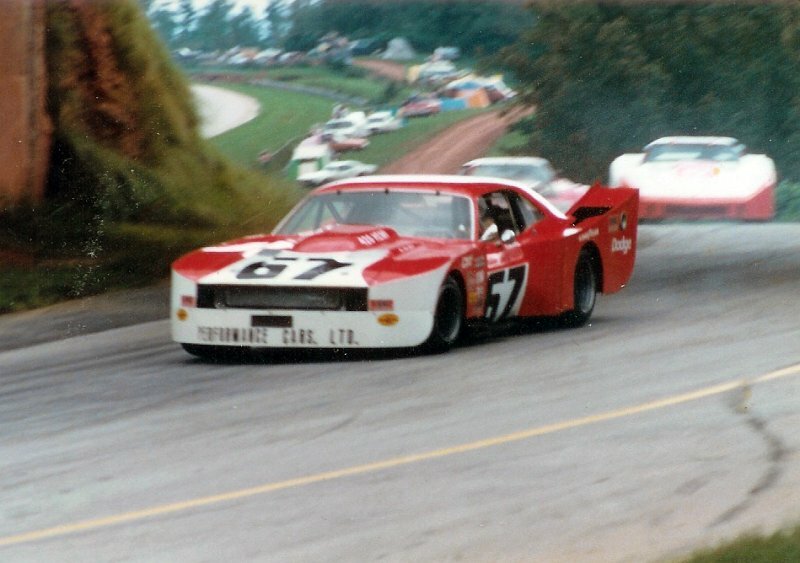 PHOTO 23 was taken at Road Atlanta in the spring of 1978. As I recall, Mr Rathgeb was in a hospital having a minor surgery and we called to keep him informed on what was going on. It turned out that there was a great controversy over the legality of the car. At first sight, IMSA clearly did not want the Hemi Challenger. The 426 Hemi worried them, with its unlimited potential. I always thought something different would be good for the series, but it seems Porsches or Chevys were always in favor. In the end, IMSA told me to take it home. I had raked the body so much that the legal fender bulges continued into the hood, due to the huge front tires. That was considered illegal, but not actually specified in the rule book. This cost me several months of time raising the body on the frame, making new molds, and then all new body panels. There was an article and picture in the Sept. 1978 issue of Car and Driver about this. See the scan at the top of the page. 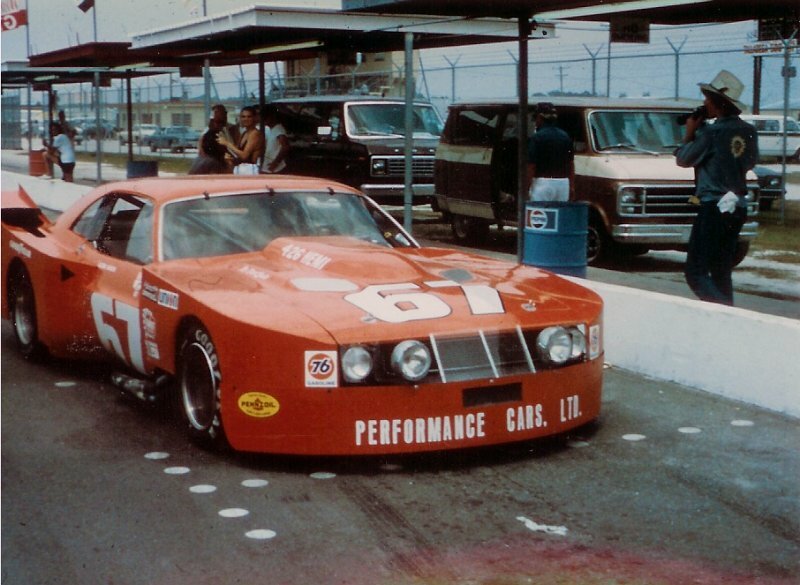 The re-bodied Dodge is in photo number 24, taken at Daytona. That’s me standing in the way. I wish you could see the front end better. It had the stock grill and headlight configuration. Also note the rear banana wing. I got this body configuration going again in 2007 at vintage races. That wing could let the car be on the loose side of neutral on slow corners, but once you are going over 100 or so, the rear stays behind the front quite nicely. This car was so fast that I never really found its limit on many fast curves. During the process of building my first 426 Hemi, I met Dave Lewis, of Newport News, Virginia. We became the best of friends, and this was truly a privilege for me. He was a bit of a living legend in his own right at that time, a true Hemi man, and a good friend of Dave Koffel. They had won each others respect while racing in the sixties. He was the first to use the name BIG RED on his race cars, a Hemi Cuda and Hemi Belvedere. He tried to talk me into running a blown injected alcohol funny car instead of going road racing, but I wanted to race with the fastest road racers in the world at that time. Dave Lewis was also a NHRA National record holder. Because of his involvement, someone at Chrysler let our small family automotive parts business become a Wholesale Distributor for their Direction Connection line of performance parts. This gave Dave and me the rock bottom price on many race parts. While building the second chassis, I was also told that if the car ran well, they would support it. This all sounded good to me, and is why the Challenger always had the Dodge livery on it. Dave Lewis was known and respected by a lot of accomplished racers. At one time or another, he built competitive motors for every form of motor sports. One night before calling it quits for the day, I explained to him the problem I was having with the right front wheel bearing getting heavily worn looking after one race on a speedway track. Several different greases were tried, but the bearings did not look good. I wondered what he might suggest. He introduced me to Junie Dunlovie, a NASCAR legend. Junie said they did not have any bearing problems with their grease and that he would bring me some down from Richmond. A week or two latter, he showed up at my garage and handed me an unlined cigar box full of green, wet looking grease, made by Union 76. It worked fine too! I will never forget that oily box. He did not have to go out of his way for me, but this type of thing was why he was a grand ambassador for NASCAR. In the meantime, Dave and I were trying to figure how to build our first engine. I had already ported the heads using the templates in the Direction Connection book before meeting Dave. He liked stock ports better for torque, but he called the shots on the rest of the engine clearances etc, and we decided not to use a dry sump oiling system to save weight. So the first Hemi was a 426, decammed pro stock motor, making at least 670HP. Dave and his friends at Chrysler suggested I not use the complete, brand new Kinsler fuel injection system that I had bought before meeting Dave. They figured I should get the car working first, and then worry about tuning the injection system. 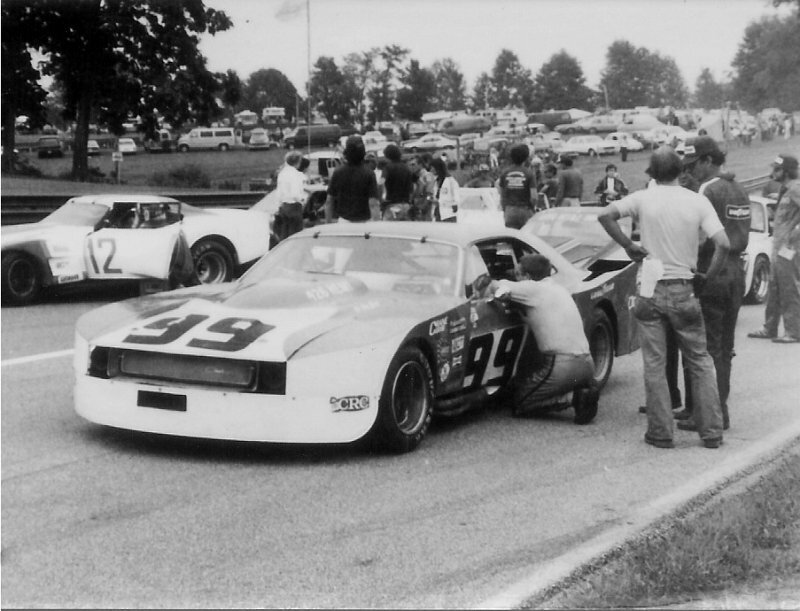 The first race for the rebodied Hemi Challenger was at Mid Ohio. After just one short practice session, the engine would not hold 40 PSI. As it turned out, the clearances were just too loose. Over the phone Dave told me to run it so I went out to qualify. At the end of the main straight in the braking zone at 7700 RPM, a beat out bearing failed and I threw a rod. The cap hit the road, bounced off and was stuck in the aluminum floor board beneath my seat! The oil made a big mess on the track too, which really upset everyone who had not qualified yet. When Fast Phil Currin and I went back to Mid Ohio in 2007, a track official asked me if that was the same car that dumped 6 gallons of oil in the braking area on the back straight 30 years ago. He remembered. Because of my disappointment with the power of the 426 motor, Dave had an old funny car crank we decided to use, by offset grinding it, giving us a 4.5 inch stroke and around 528 cubic inches. I always did all of the time consuming, tedious work on the Hemis and assembled them with Dave. He liked to use offset dowels to locate the heads accurately over the pistons and then he would cut the piston domes on a milling machine to fit closely into the heads. On all of our Hemis, there were always 4 or 5 pistons that were lightly touching the heads and valve pockets in the pistons with shiny circles where the valves were touching just enough to keep the carbon off. It took many hours of machine shop time to achieve this close fitting that Dave wanted. The engine also had to be trial assembled several times before it was ready for its final assembly. All of this work was done in my garage. Finally, I was off to Road Atlanta for a 100 mile sprint. After 22 laps, that fatigued old crankshaft broke. I was home ward bound again. This time we used a used Heath billet crankshaft, a different cam profile and headed off to the Daytona Finale. I should mention here that this whole time I was using a Holley Dominator on an open single plane manifold called a Rat Roaster by drag racers. The Rats were the Chevys. I could never get the carb to go around corners without loading up, etc. Messing with the Holley ruined this race for me. It was awful. After 18 laps this crank broke too. That was it for me. The best drag racing brains out there could not fix the carb problem and the Dodge was just too heavy, at 3400lbs. I was going to do it my way now. 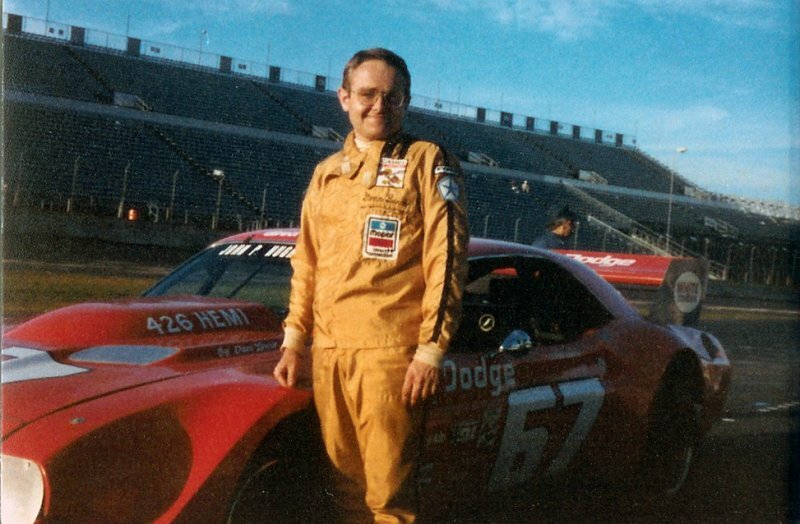 By 1975, I had become the unofficial team engineer for a local team racing Late Model Sportsman cars. Whenever they had questions or a certain problem on their minds, they asked for my opinion. This allowed me to try out all sorts of my ideas without getting my hands dirty. It was great for me and they were the track champions for 3 or 4 years, until their team broke up due to the lack of a sponsor. From this and the drag racing experience of Dave Lewis, I saw the effect of low and high roll centers, Ackerman steering, the advantages and effectiveness of a 3 link rear, offset chassis, light total weight, lower unsprung weight, etc, etc. Now I knew I wanted lower roll centers for more sideways bite and tire heat in large tires and more anti-dive in the rear for forward traction. I also knew that the car needed to use as many off the shelf parts as possible, and preferably a readily available front and rear snout to make repairs simple and fast. The fastest cars running were the light weight flexi flyers, like the turbo Porsches. There is an old saying about a silk purse and a sow’s ear. The same is true about light race cars. “You might not be able to make a silk purse from a sow’s ear, but you can sure have one damn fast pig!” I made several 16 inch models of the chassis I was planning to build out of balsa wood sticks. The front or rear of the roll cage could be pressed onto a desk with the other end over hung, allowing you to twist it to see its torsional rigidity. If a stick flexes, it is over compressed etc. You study it to get every plane triangulated with as few sticks as possible. After adding and removing sticks for a while, you end up with a well triangulated, rigid chassis. I also tied the engine block into 2 motor plates to let it stiffen the front of the chassis. Now I had to find a cheap, fast way to build it using as many affordable parts as possible. I weighed every piece of this car so I could control the final weight. No more surprises for me. Compromises had to be made too. IMSA was changing so quickly by this time that you really needed a new car ever year just to keep up with the liberal rules interpretations. I ended up using a front snout from a NASCAR Modified made by Maynard Troyer. His chassis used rear leaf springs at that time and I wanted a 3 link. Dave Lewis introduced me to Emanuel Zervakis, the Flying Greek as he was called when he was a driver. He owned and ran Stock Car Products in Richmond, Va. with his sons. He was a truly fine sportsman with a wealth of chassis experience behind him. We hit it off well from the start, and I really enjoyed the time I spent with him. He got a kick out of my model frame. He wondered if the large x brace in the floor from corner to corner in the rocker panels was really necessary. I had him twist the model for a minute to check its strength and then I snipped one leg of the large x brace. He was amazed at how the frame became all soft and how the cut in the tube opened into a gap in tension and the ends would overlap in compression. He tried using an x after that too! Once it arrived, my front snout was tacked to a surface plate, and then he tack welded in the side rails and welded in the frame and mounts for the custom made 3 link rear. Once he was happy with it, one of his men tied in the cage etc. to my dimensions and used my 16 inch scale model as a guide for tube locations so it would all fit under the Challenger sheet metal. He did all of this and more for around $1300. Like I said before, many people went out of their way to be helpful to me. To ensure that the dry sump system was done right, Dave took me over to Portsmouth to meet Henry Lauterback for a lesson on dry sump design. He explained what had been successful on their hydroplane race boats over the years and I followed his advice. I used the fiberglass doors, hood and trunk lid that I had already made off of the old race car. Then in two weekend’s time, I used angle aluminum to form the edges of the fenders and riveted aluminum skins to it making the four fenders. I gave the body the best watermelon shape in the front that I could. Each rear fender held a water radiator, to get weight off of the front of the car and to close off air going through the nose of the car, to reduce drag. Then I made a full belly pan to further lower air drag. The rear fenders were flared upwards for down force, an idea Phil Currin had proven to work on his AAGT Corvette. The entire grill opening was ducted for the brakes, with a small opening for the oil cooler. No other air went through the car. I called this my Batmobile or anti-IMSA body, because of the time and money they had caused me earlier. This new car weighed around 2750lbs, with a cast iron Hemi block and 32 gallons of gas. That’s a full 1000 pounds lighter than the first one! PHOTO 25 shows the car with its night lights on for the Paul Revere 250 at Daytona in the pit lane. It is interesting to note that when Dave and I first took it to a drag strip for testing, with no rear anti dive dialed in I could smoke the tires to 120MPH or so. With the three links at their steepest angles, it hooked up so tight I had to try hard to break the tires loose in first gear. I soon discovered that if I had too much anti dive dialed in, while exiting a low speed turn, 80 to 100MPH, the car would not steer. It would push straight off the road with it’s locked rear axle! I had to find a balance where the car would be neutral or a little loose while exiting on the power. Also, the more anti dive you use, the less rear brake you will have. The axle tends to lift on braking, because of the opposite torque, causing rear tire lockup. You have to seek a balance where the car handles nicely and laps the fastest. The cars first race was at Brainerd. To me, it was just a test session. That was the last race for the Holley carb, which still did not work very well. By now, I had a spare engine. It was a short stroke engine that had been built for the shorter tracks in NASCAR races. I believe it was 405 cubic inches with a mild flat tappet cam, STX 22 grind and the internal Petty dry sump system and pan. This motor just showed up at Dave’s one day. Someone at Chrysler found it in storage and Mr. Koffel sent it to Dave knowing it would be put to good use. It became my spare, and I never owned it. At Brainerd, with this little Hemi, the car sorted out well, but was down on power, compared to other big block cars. Years later, I am convinced that the 2.25 inch primary pipes were too big for the small motor. I finished 21st at Brainerd. The results are located here. The next race I went to was the Paul Revere 250 at Daytona. To solve the carb problem, someone at Chrysler, probably Dave Koffel, told us that a dozen or so Weber manifolds had been cast for the Hemi, and that Moon Engineering might still have one left. I called and they did. So for $1500, I had a perfectly tuned set of 48IDA Webers on my little Hemi. This was the first race and test session for the Webers. After the first practice session, I realized that for the first time in my life, I was at a race track with a car that that was really drivable, flat out; all systems were ready to go. I just couldn’t find anything that needed attention. The Webers put 500rpm on the top end and used less gas too. The race started just after midnight, on the 4th of July. At night, the yellow lights along the top of the banking flashed by like a neon tube. It was really nice, like a warp speed experience from Star Wars, or flying in your sleep like Superman. You need to understand that this was the second time that the car had ever moved under its own power and the second time I had ever raced or driven it. All of the springs, shocks and sway bars were hand me downs with no development time on the chassis. Once the race got under way, I seemed to be able to stay up with the front group. I set a pace with Phil Currin, and his AAGT Corvette, knowing that he would usually finish well, and noticed that he made several pit stops that night. I made my one stop for fuel as planed and thought that I must be ahead of Phil, around 4th or 5th overall. Suddenly, when the 250 mile race was about over, all of my lights went out. There was enough background light there that you could see where the road was, you just could not see what’s on it. I did 2 or 3 laps in the dark, each time getting a black flag at the finish line so I decided to pit or be disqualified. It cost me 2 or 3 laps to get the lights working. I finished 9th overall and 4th in the GTX class with 59 laps. 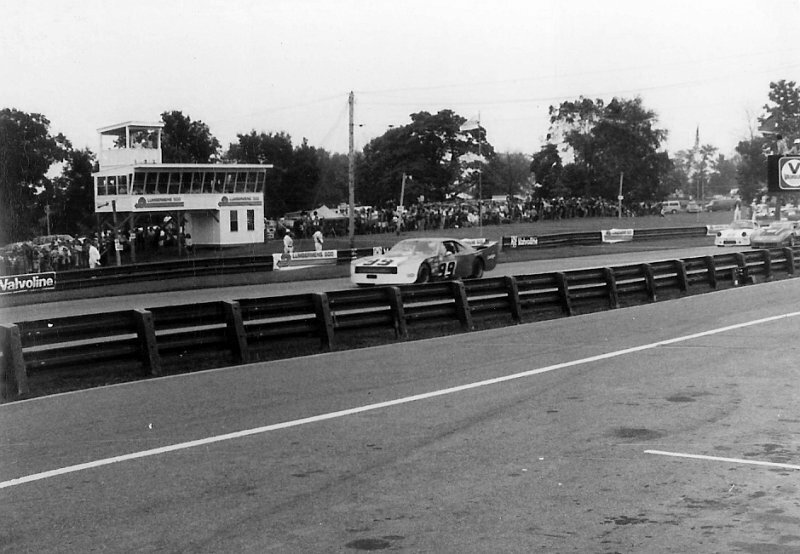 Phil had 61 laps in 4th and Peter Gregg’s Turbo 935 was in third place with 63 laps. If the light relay had not failed, I may have been third or fourth instead of 9th. After the race, Phil told me I had done a good job staying up front. That was a great compliment to me, and one of the most enjoyable races I have ever run. I thanked him and said that everything seemed to work well and that I shifted at 7500 RPM every shift and ran 7300rpm down the front straight, with a 3.07 rear gear and 27inch OD rear tires. He looked surprised and asked ‘’how did you keep it together?’’ It’s a NASCAR engine, designed to run there all day long I said. I really don’t know what he thought of my answer. I did not mean to be so short. Apparently my aero package was working well because I sure did not have lots of horsepower for that big car. For the outstanding results, click here. The next race I went to was at Mid Ohio. It was a beautiful summer’s day and I had a good 528 Cubic inch aluminum KB Hemi ready for action. The car weighed in dry at 2450lbs! This one had another used Moldex billet crankshaft, but had been x-rayed etc. and was OK and a repaired KB block that had been windowed. It should have made 700 foot pounds of torque and around 800HP. As I recall, everything was working pretty well and the car was real fast on the straights. On the 68th lap, a water hose popped off of a water pipe in the rear of the car without my knowing. Suddenly, once the oil temperature rose, the oil pressure dropped and my oil light came on so I pulled off on the back straight. It was cooked. Back home, I found the Teflon buttons on the pistons had even melted! Only 1 piston needed to be replaced. The bearings were fine and the stainless top rings were used again too. For the disappointing results, click here. A few weeks latter, there was a 500 mile race for any kind of car, an invitational event at Mid Ohio called the Lumbermans 500. The later Lumberman races were 500 kilometers because of the high attrition rate. On short notice, Phil Currin asked me if I was interested in going. Are you kidding, co-driving with a pro, what an opportunity, and the car was better now too. Just think what I could learn with his input. The 528cu stroker motor was in the car and the little 405 cubic inch Hemi was in the trailer, lots of spares parts were loaded up and I was off to the races. I believe Phil had just bent up his super light and fast AAGT Corvette and he hated to miss this event. We soon found out that there was so much torque available that you had to shift very smoothly and squeeze on the power. The engine made so much torque that all of the teeth on third gear striped off while Phil was driving in a practice session. I tried a 3.07 rear axle ratio just to save the engine in a 500 mile race. It was less than a second a lap slower, so I left it in the car for qualifying too. In spite of the Daytona gear, Phil qualified 16th, right along side of Chris Cords absolutely beautiful De Con Monza., ahead of all the other V8 powered cars and a well known Greenwood Corvette. This was the mostly highly developed Monza in existence, and the reason the Dodge was built. The Porsche 935 Turbos were too much for a small block of any kind. They could not make the needed power and live very long, and it didn’t. PHOTO 26 shows me by the door talking to Phil in the pits. PHOTO 27 shows John Gunn’s Lola and the Mirage right behind him at the start. 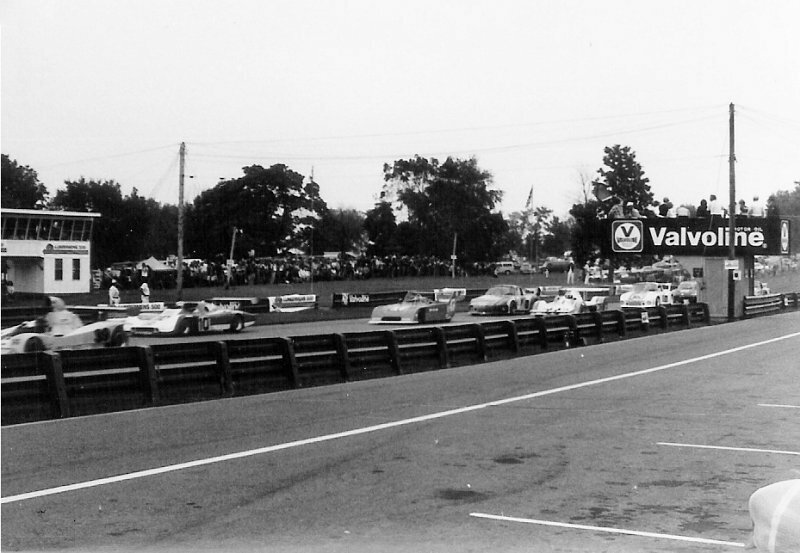 Notice the tiny Ralt of Brian Redman and Bobby Rahal in the center of the picture. They eventually won, but were dropping back near the end. Behind the Ralt, you can see the Sachs March and then the Gregg and Haywood Porsche 935 Turbo. PHOTO 28 shows the gap that Phil had opened up on the third lap over Dave Heinz and Jerry Thompson in their big block Corvette. PHOTO 29 shows the Dodge close up. The 426 Hemi Dodge Challenger was truly the junk yard dog in that race. After an unnecessary pit stop for oil, staying on the slicks too long before switching to rain tires, spinning off at least once, and numerous minor mistakes, including colliding with a sports racer, Phil and I finished 5thoverall and first in the AAGT class. Click here for the exciting results. Phil said “you could tell the car was made for the driver. It drove more like a Porsche than a Greenwood Corvette. The driver didn’t have to work hard to go fast”. That to me is the mark of a good GT car. Right after the race, Peter Gregg told Phil that in the rain , the Dodge matched their fastest lap time to a hundredth of a second, and was the second fastest car there in the rain all day! That was quite a complement for me and a surprise to us both. He also mentioned that the car was setup too soft for the dry, but Phil pointed out that it rained all day. I did increase the spring rates later in 2005. A couple of races later I went to the 100 mile sprint at Road Atlanta. I had changed the rear gear from a 3.07 used at the Lumbermens 500 to a 3.31. We shifted the stroker motor at 5500 to 6000 RPM because it stopped pulling there. Dave Lewis and I had been working on another stroker combination, with Kinsler fuel injection. We took another Moldex 4.75in stroke crankshaft and turned it down to a 2.2 inch big block Chevy size by offset grinding, giving a five eights stroker crank. Then it was magnafluxed and found to be OK. Crane sent us another steel billet camshaft that should have pulled to 7000 Rpm and Venolia made a set of aluminium rods, good for 500 miles.. This combo would have revved faster and made well over 800 HP. As the clock ran out, the engine did not get its final assembly so I went to Road Atlanta under geared with the same stroker motor used at Mid Ohio, which was in fine shape. Up until now, I had always used a Franklin quick change rear end. It was being destroyed by the torque, so I built up a nine inch Ford stock car axle and the 3.31 was the only ratio I had prepared. It was about 30 MPH off on top end from where I should have been with the lower RPM motor. PHOTO 26 was taken there under the bridge. Ten laps into the race, the car became wet from fuel inside, so I headed for the pits, hoping it would not ignite. One of the carburetors banjo fittings had come off and was spraying gasoline everywhere. My friend Powel Hughes went off looking for the hollow fitting and a long time latter, like 30 minutes or so , he returned with one. After running a few more laps, I finished 28th because of so little on track time. Click here for the disappointing results. That was the last race for the Challenger. In the fall of 1979, I started working on body molds to make the Dodge look nicer and narrower with smooth sides, as I had promised the Dodge boys, with reduced frontal area. The plan was for it to run well over 200 MPH on speedway tracks. While doing these changes, I wanted to build a new car because now I could lower and elongate the nose like a certain Corvette did, leave off the rocker panels which would lower the roof 4 inches like Charlie Kemps Mustang did, reducing frontal area and drag, and add a window above the rear window like John Paul’s tube frame 935 Porsche had done and the Kremer 935s. All of this would be legal for me now because they were allowed to do it in the GTX class. I would end up with a car that was shaped much like a 935 and I knew it could weigh 2300 lbs. It would have been really fast at Daytona especially with a good, competitive driver like Fast Phil Currin behind the wheel. I called IMSA and asked if they would let me run this new car for four or five years before it was ruled illegal, and never got an answer, which meant no. At the same time, Chrysler had just gone broke and they said my timing was terrible, so no future help from them was in sight. 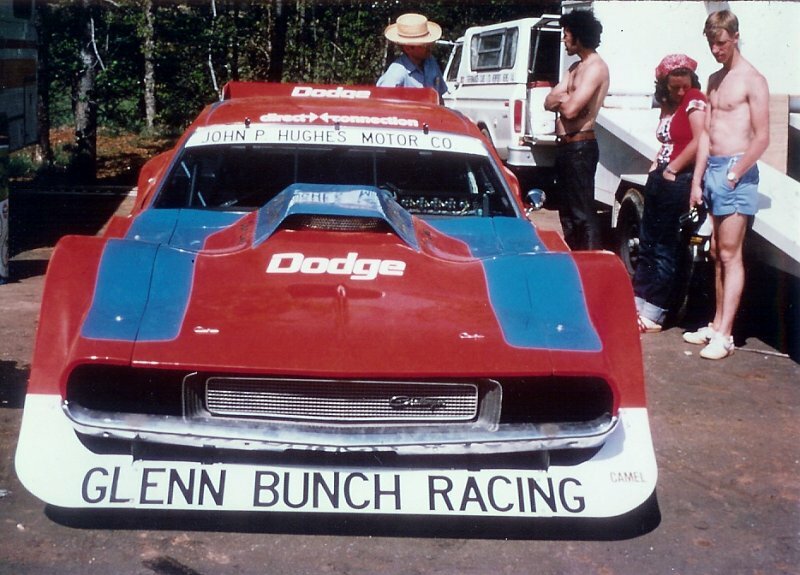 As a result, the Dodge ended up sitting out the 1980 season on its fourth body and with its best engine ever, a new unfinished chassis and a forerunner of a Jerico 4 speed, ready to race. I was burned out and with no end in sight to the rule changes, so I took a time out. Peter Gregg’s death did not help matters either. It really made me stop and think why was I doing this? One year later, I ended up starting a logging- lumber business and never got any time back for myself. Over the next 30 years, I built several garages to keep my race cars in as I moved around, thinking they might run again someday.